Although I somehow missed it growing up, 1978's 'The Great Gilly Hopkins' by Katherine Paterson was evidently a very popular book geared towards the adolescent crowd. It has staying power, too, having ranked #63 in a survey of all-time children's novels published by School Library Journal. It's not a surprise that such a perennial favorite would be turned into a movie; just kind of odd that it took so long. 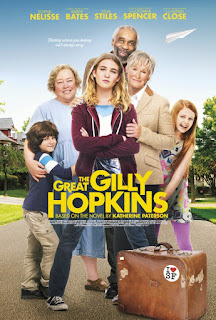 Near as I can tell, the film version of THE GREAT GILLY HOPKINS follows its source material faithfully, aside from gender-swapping one of the characters from female to male. Gilly (Sophie Nélisse) is an angry young girl who has been shuttled from one foster home to another since being left behind by her mother (Julia Stiles). Her social worker Ellis (Billy Magnussen) is pretty much at the end of his rope when he places his charge with experienced foster parent Maime Trotter (Kathy Bates). Gilly doesn't much care for Trotter, who she considers saccharine sweet and a bit too religious for her taste. She does, however, warm somewhat to the other foster child in Trotter's care, a young boy named W. E. (Zachary Hernandez). She even protects him from bullies at school. Completing the makeshift family is an elderly blind man living next door, Mr. Randolph (Bill Cobbs). After the usual assortment of misadventures and misunderstandings one expects from this sort of story, Gilly starts to actually like her new family. That's just about the time her grandmother Nonnie (Glenn Close) shows up, having only recently learned of Gilly's existence. Also, a letter Gilly wrote to Children's Services that gave a negative (though untrue) portrait of life with Trotter comes back to haunt her. It's not a bad story, and in fact there's some complexity and nuance here one doesn't always find in kid's films. Unfortunately, what probably felt fresh and even a little edgy in 1978 seems more by the numbers in 2016. There's also a flat, "made for TV" movie feel to the proceedings. That's especially disappointing given director Stephen Herek's resume, which includes such widely loved films as BILL & TED'S EXCELLENT ADVENTURE, THE MIGHTY DUCKS, and MR. HOLLAND'S OPUS. Although it ultimately goes in a very different direction, HUNT FOR THE WILDERPEOPLE from earlier this year had some similar themes and plot elements, but managed to express them in a more distinctive and cinematic fashion. THE GREAT GILLY HOPKINS is getting a (very) limited theatrical release, but in all honesty there's little about the film distinguish it from a small screen effort. If you're looking for a family film to go to with your tweens and just want to get out of the house, then sure, why not. But if you'd prefer to catch it in the comfort of home, where it premieres the same day on VOD as it opens in theaters, you won't be missing much other than the overpriced popcorn. 2 ½ out of 4 stars.